In 2017, the state finalized the Greater Minnesota Transit Investment Plan, a 20-year strategic plan for investing in public transit and reaching the legislative target of meeting 90 percent of transit needs by 2025. Thirty mid- and small-sized service providers have been grouped into five Greater Minnesota regions. Through a competitive request-for-proposal process, a consultant team has been selected for each region. By summer of 2019, each of the 30 providers will have a personalized five-year plan that identifies strengths, unmet needs, and future transit service changes, as well as a financial plan that is adaptable to changing environments. The five-year plans will help MnDOT and MPTA better articulate transit needs to the legislature. Strategic planning is critical for any organization to improve service and adapt in a constantly changing environment. Transit service is a critical part of the communities where it operates. Future transit service planning needs to be integrated with other local long-range transportation and economic development plans. 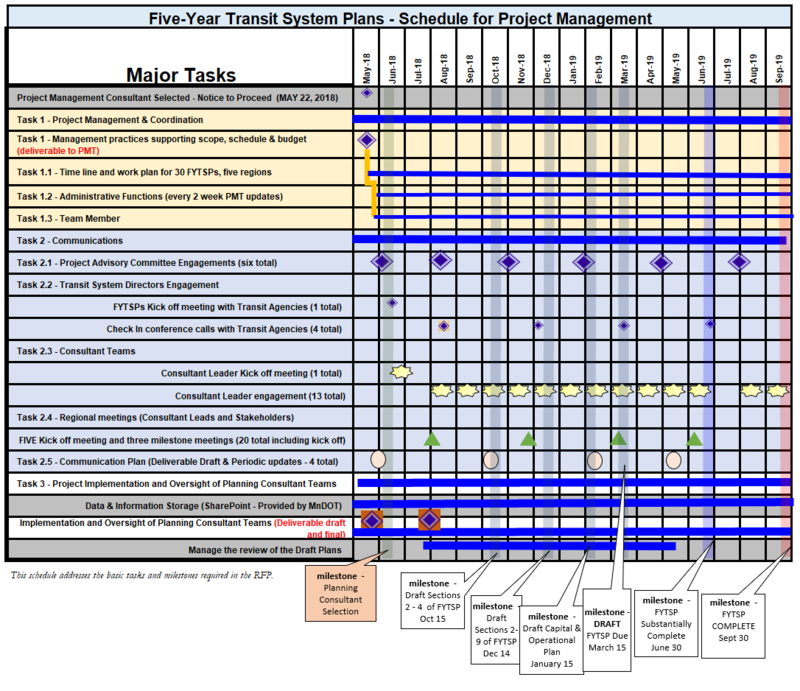 The goal of this five-year planning process is for each transit system to understand strengths and weaknesses, identify unmet needs and future transit service changes, and develop a financial plan that is adaptable to changing environments. Plans are intended to help systems work with local government officials, local planning agencies, transit system board members and other organizations to prepare for changes and opportunities. Transit directors recognize the importance of involving local officials in planning activities to continue building local support for improving transit systems, including long-term commitment of local funds to leverage state and federal dollars. MnDOT is committed to fund consultant support for these transit providers to develop a five-year plan to address specific community needs. Consultants will begin working with transit systems in July 2018 and complete all five-year plans by June of 2019. To jump start work on the five-year plans, local data is needed. The 30 participating providers are requested to fill out the spreadsheets linked below. Completed forms may be uploaded on the Sharepoint site or sent to Sara Dunlap at sara.dunlap@state.mn.us. Please complete the forms by July 1.